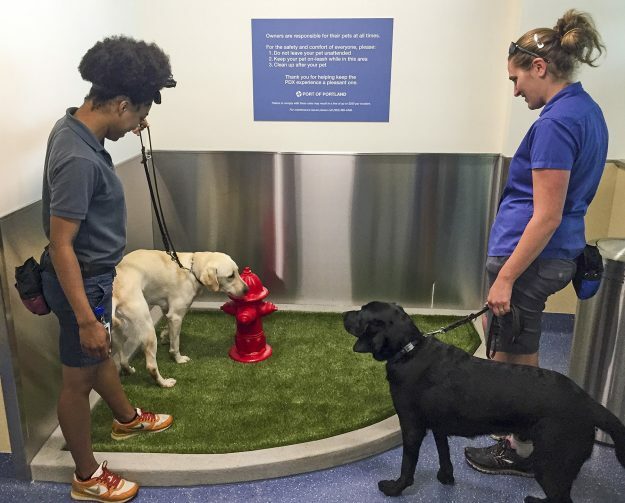 Portland International Airport has added a pet relief area to its airport. This means that passengers and their pets don’t have to leave the airport secured area anymore and then walk through security again before a flight. The pet relief area is small, but has the essentials: a fire hydrant, some fake grass, and a garbage can and supplies to clean up after your dog. The airport already had an outdoor area but this makes it more convenient and easier for pets who are traveling. Have you traveled through the Portland, Oregon International Airport with your pet lately and checked out the new indoor relief area? Let us know what you like about it. To read the full story, check it out here.